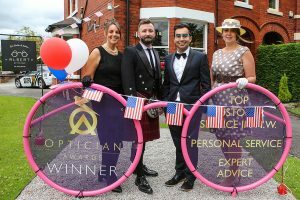 In July 2017 Albert Road Opticians hosted an Oliver Peoples eyewear event. Oliver Peoples is an eyewear brand that is made in California, USA so we decided to go with an American theme. As the eyewear we were showcasing is made in Hollywood, we decided to dress up as Hollywood Stars. 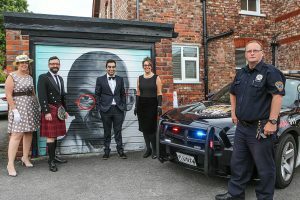 In attendance were Sean Connery, Audrey Hepburn, Julia Roberts and James Bond. We also had an American themed police car that was a last minute addition. It was a HUGE hit especially amongst the little ones and surprisingly Cheshire police who kept waving at us whilst passing by. 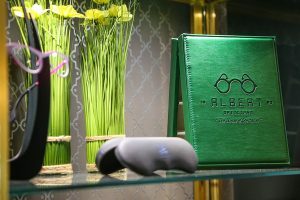 Amongst the incredible eyewear we had a host of treats. The cup cakes proved to be the most popular! 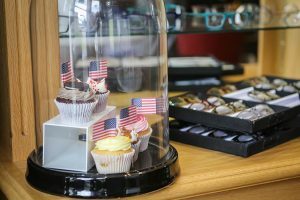 Trunk shows are events that we organise during which we ask our suppliers to come along and sup- port us for selling their glasses. On such days we have a bigger selection of frames on show and some offers for you. It’s a great informal way of introducing your family and friends to us. It gives us both an opportunity to meet and have a chat with each other.